Upfront collateral required for trading: shares, bonds, unit trusts and cash are acceptable forms of collateral. Trade online through our suite of POEMS platforms, POEMS 2.0, POEMS Mercury, POEMS Mobile 2.0 or through your trading representative. If you do not opt-in for Multi-Currency Facility, all trades will be settled in SGD equivalent regardless of traded currency; prevailing exchanging rates apply. Earn 0.8462% SGD p.a./ 1.0355% USD p.a. on your idle funds. Rates updated as of 22 January 2018, based on 1-year rolling return, NAV/NAV prices. Past performance is not necessarily indicative of future performance. View disclaimer. Lend your Securities to earn up to 4% p.a. Up to 20 times leverage. All copies of documentation has to be scanned or photographed from the original document. All supporting documents should be in English. Otherwise, there is a need to have each of these specific documents translated and certified by a qualified translator/translation company. For mailing address that is different from your residential address, please provide additional supporting document(s) issued within the last 3 months that reflects your mailing address. What are accounts available in Phillip Securities? Who can apply for Phillip Account? Anyone above the age of 18 years old and with no adverse records with the SGX or Court is welcome to open a Phillip Account. 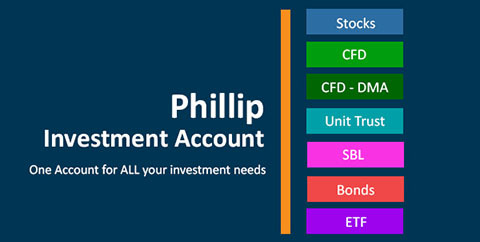 Can I open a Phillip Account if I have a trading account with another securities firm? Yes, there is no restriction to the number of trading accounts you can open. How do I link my existing Phillip Account to POEMS? All you need to do is to fill in a simple form furnishing us with your account details and we will mail the password to you. You also may also visit our investor centres, web-site, or request that this form be mail to you. How do I open a Phillip Account if I am a new client? Kindly visit our office or Investor Centres to fill in the following application forms. All new application forms must be signed in the presence of a Phillip Securities witnessing officer as per SGX regulations. For the required documents, please click here. How do I open a corporate account with POEMS? Application requires two authorised signatures and the company's stamp. The two authorised persons who sign on behalf of the company are to produce their National Identity Card. How long does it take to process a new Phillip Account? It takes approximately 10 working days to process the account, subjected to approval and clearance by the proper authorities. Why has my account application been rejected? The common reason for rejection is a difference in the particulars or signature submitted compared to the record in CDP. To update your particulars, you may request for a CDP7 form to be sent to you. If you wish to update your signature, you may do so at CDP. Remember to inform us of the changes so that we may resubmit your application for approval. You will have to fill up the CDP form to update your particulars. (e.g. change of address) Written requests will not be accepted by CDP. For Cash Management account holders, please contact us after you have received notice from CDP that your address has been changed. If you have Unit Trust account, please write in to Unit Trust department to update your new address. What are the different types of Phillip Investment Accounts? Please find more details about Phillip Investment Accounts here.